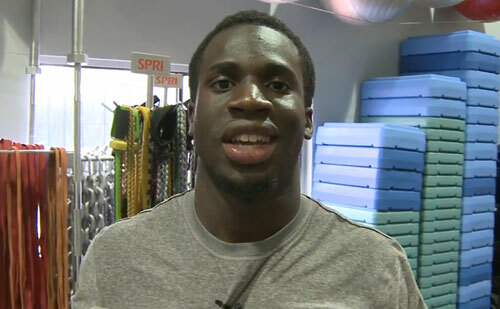 New York Giants cornerback, Prince Amukamara, conducted an interview in 2010 when he was a football player at Nebraska. In the interview Amukamara speaks about his Christian faith and how it affects his every day life. Photo shows New York Giants cornerback, Prince Amukamara, speaking with ProPlayerInsiders as a rookie in 2011 about what he’s been learning from his NFL colleagues on business, family and football. Prince Amukamara played collegiality at Nebraska and was selected in the first round of the 2011 NFL draft by the New York Giants, winning a Super Bowl title his rookie year. He has been called the “Black Tim Tebow” by some of his teammates because of the comparisons to Tebow’s similar Christian lifestyle. If you would like to book Christian speakers like Prince Amukamara for a speaking engagement, personal appearance, church function or endorsement, contact our booking agent for appearance and speaker fees or call 1.855.303.5450.